During lunch at work today we had some visitors and they made an interesting first impression. 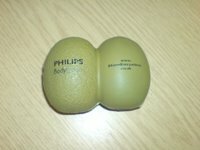 Another colleague had arranged for them to come and visit us to show us the Philips Bodygroom. It was an experience anyway as basically they walked around the office giving us an interesting shaped stress ball that displayed the difference in texture supposedly comparing the closeness of the shaver to others. I managed to get roped into shaving one of the fellas legs which was comical and I don't think that either of us were over confident in what we were doing. Anyway it made a change from the usual lunches and no sooner had they arrived, they were off into the world to show everyone the way forward in body grooming. Later that day the shaped stress balls became weapons of mass destruction, they were torn into halves and thrown around like grenades. After work was funny as due to me staying in London for the majority of the evening for the concert we set up an ambush for one of our colleagues who had gone to the toilets. He took forever and we were crouched behind a desk for what seemed like an age. When he eventually appeared he glanced over at our desk area which was away from our ambush point and noticed we weren't there. We then stood up and bombarded him with the balls. We were falling around laughing until there was return fire from him throwing back what we had thrown at him and then more laughing. What is it that well known saying about small things and small minds ! !